Traffic signals are controlled dynamically along tunnel sections so that the traffic flows safely and without delays. 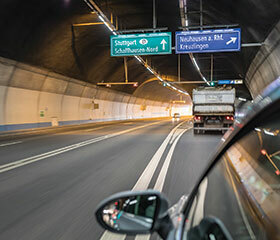 In and around the Cholfirst Tunnel in Schaffhausen, Switzerland, easy managed switches from Phoenix Contact ensure that the necessary data is transmitted reliably between the traffic facilities and control engineering. The Swiss A4 highway is an important transit route for north-south traffic. Every day, over 25 000 vehicles use the northern section of the A4 that also serves as the Schaffhausen expressway and is a central part of the regional traffic system. The two lane section between Schaffhausen-Nord and Flurlingen comprises several tunnels and crosses the Rhine between the individual tunnels. When driving through, the drivers of cars and trucks and motorcyclists barely see anything of the technology that is installed within these structures. This operating and safety equipment ordinarily ensures that the traffic flows smoothly. If, however, there is a power failure, fire or accident, these technical systems can also save lives. The operating and safety equipment is divided into different utility systems – such as energy supply, lighting, ventilation and traffic management – each with its own independent control technology. The Schaffhausen section of the A4 was opened back in 1996, and, as a result, the technology installed at that time was becoming outdated, and in some parts no longer met current requirements. Therefore, the Swiss Federal Roads Office (FEDRO) initiated a refurbishment programme to increase the safety of the tunnel. The Swiss company, Ticos Engineering & Software, based in Feuerthalen in the canton of Zurich, was commissioned with renovating and modernising the operating and safety systems in the Cholfirst, Fäsenstaub and Schönenberg tunnels. As a system integrator, Ticos realises control, regulation and management systems for tunnel, building, and process automation. The company specialises in tunnel and traffic control technology and has built up extensive project experience over the years, with its regional focus in Switzerland. One of the challenges when realising tunnel applications is that they should, in the best case, be implemented without affecting the smooth flow of traffic or operations. Tunnel closures are the absolute exception and if necessary must be planned long term, and for periods of off-peak traffic flow. Against this background, the individual phases of the respective projects as well as their timely execution have to be planned in detail well in advance. The control engineering system for traffic control in the 1260 metre long three-lane Cholfirst Tunnel was modernised during the first project phase. To ensure that the work had as little impact on the traffic flow as possible, the control engineering system was renovated successively during ongoing operations. As a part of the project, Ticos replaced the system control installation and several local controllers. The associated control cabinets are situated in the engineering rooms or respective sub-distribution stations of the two tunnel portals. All of the existing and a multitude of new traffic signals are connected to the traffic control engineering system here. The Ticos employees gradually transferred the signals from the existing over to the new controller. Ethernet-based communication was also installed at the field and control level as part of the modernisation of the control engineering system. A redundant Ethernet ring based on single-mode fibreglass technology was installed to cover the large distances involved and to ensure high availability. Ticos selected Managed Ethernet Switches of the FL Switch 2200 series from Phoenix Contact as the infrastructure components. A key factor in this decision was the easy handling of the devices. The switches can be set up in a redundant ring topology without any further configuration. As the control network had to be set up quickly, it was an advantage that no further time-consuming configuration work was necessary. This is because the basic function of a plug-and-play switch is already assured in the necessary ring topology. This simplifies startup because the network is available again quickly after a rework operation or an extension. The 2206-2FX-SM switches have two single-mode fibreglass interfaces with SC Duplex connectors, as well as six twisted-pair copper interfaces with RJ45 connectors. The single mode ports are connected to the fibreglass installation via FO patch fields. The fibreglass cables run in parallel between the two tunnel portals below the carriageway service duct. Here the signal and communication cables are routed on cable racks alongside the supply lines for water and energy. The switches are mounted in the transverse control boxes in the tunnel service duct from where they are coupled to the fibreglass ring. The main and local controllers installed in the substations are connected to the switches via RJ45 ports. The components are installed in the engineering rooms of the two tunnel portals. Switches with single mode uplinks are expanded in the substations with versions that have eight twisted-pair ports so that further communication devices can be integrated into the network. The traffic control system includes the lighting of static signals, indicators, traffic lights, and lane and switching signals. The scope of the traffic control engineering system includes the tunnels, their entrance zones and the associated open roadway sections. A rerouting system is operated in the project section of the A4. This means that the transit traffic is able to be diverted to the nearest possible connecting route in the event of a scheduled tunnel closure or when the tunnel has to be closed at short notice. Two alternative routes have been identified for this purpose, each of which are displayed via prism rerouting signs. Rerouting signals such as the prism rerouting signs were previously connected in parallel to the control engineering system. With the new solution, it is now possible to couple to the switches directly or via serial/Ethernet converters, depending on the version. The use of Ethernet technology thus supports both the migration of existing field devices and their expansion. While the switches installed in the engineering rooms can be accessed easily by the service personnel, the devices installed in the service duct stretching for kilometres can only be reached after a correspondingly long walk. Accessing the switches via which the rerouting signals are controlled also involves considerable effort. These are installed on the masts and gantries in the entrance zones and in the open roadway sections. Therefore, the Ticos employees can use the central Network Manager startup tool from Phoenix Contact to assign the devices an IP address. Should further settings be necessary, these can also be configured via the software. Employees can thus configure all of the installed switches and perform diagnostics from the engineering room. Furthermore, the Network Manager can be used to maintain and archive the configuration data of the switches used in the project.